Smartphone apps – mainly free ones, bless them – continue to change my everyday routines, enhancing once mundane duties into short, fun tasks. For instance, I can find and launch apps to change channel on my TV and adjust my stereo quicker than I can locate the remotes needed to do both. I use an app to record wine labels and tag how enjoyable they were much more easily than I can recall them. And with nifty little Instagram I can enhance photos and share them much quicker than I could ever launch Photoshop and email pictures of my coffee to a bunch of strangers. But I am running out of worthwhile things to share. And I am asking myself more and more, why are we all sharing photos of our coffees? Sure you might be excited by the smell and the unique design doodle in the latte froth, but all we see is a coffee. Like a meal, it’s a multi-sensory experience, not a visible moment. You’ve dumbed it down and crowded my feed – pardon the pun. An occasional, extraordinary meal, sure… Tell me all about it so I might cook it or visit that restaurant. But snack food? A good espresso? 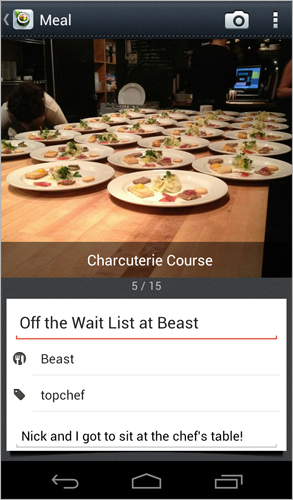 Now you can capture the time, location, menu and photos of your favourite culinary experiences. This app will even link your meal with other items you have saved in generally awesome notebook app, Evernote. And as you will find if you put all this effort in with Evernote Food, your meals are now shareable. So not only can you record every meal in detail, the menu, service, location and attendees, you can also tell everyone who wasn’t there!